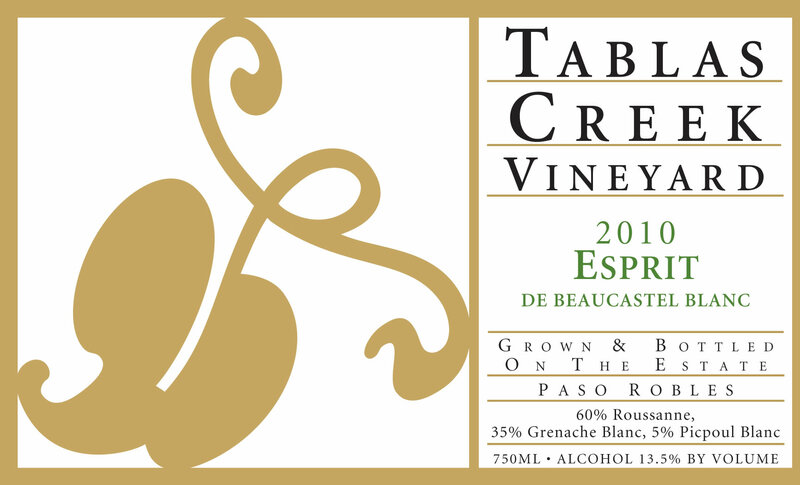 The Tablas Creek Vineyard Esprit de Beaucastel Blanc 2010 is a blend of three estate-grown varietals, propagated from budwood cuttings from the Château de Beaucastel estate. Roussanne provides the core richness, minerality, and flavors of honey and spice, while Grenache Blanc adds green apple and anise flavors, a lush mouthfeel and bright acids. Picpoul Blanc completes the blend, adding a saline minerality and tropical notes. The 2010 Esprit de Beaucastel Blanc shows a powerful high-toned nose with aromas of passion fruit, mango, ginger, asian pear and herbs. The mouth shows classic Roussanne flavors of honey and white tea, a touch of tropicality coming out with air. The long, clean finish shows an appealing saline minerality and the structure to age. The wine will benefit from short-term cellaring, and drink well starting in 2012 for a decade or more. The 2010 vintage saw healthy rainfall after three years of drought. The ample early-season groundwater and a lack of spring frosts produced a good fruit set. A very cool summer delayed ripening by roughly three weeks, with harvest not beginning until mid-September and still less than half complete in mid-October. Warm, sunny weather between mid-October and mid-November allowed the later-ripening varieties to reach full maturity. The long hangtime and cool temperatures combined to produce fruit with intense flavors at low alcohol levels. Roussanne was harvested between October 12th and 27th, Picpoul on October 16th and 22nd, and Grenache Blanc between September 21st and November 12th. The fruit was whole cluster pressed, and fermented with native yeasts. The Roussanne was fermented in a balance of stainless steel fermenters, 60-gallon oak barrels, and one 1200-gallon foudre. The Grenache Blanc was fermented partially in stainless steel and also in one foudre, and the Picpoul Blanc was fermented in small neutral oak and stainless steel barrels. All the wines went through malolactic fermentation. The lots were selected and blended in April, and bottled in August 2011.